SPOTLIGHT: History’s most momentous climate decision was made by people with substantial conflicts-of-interest. BIG PICTURE: In November 1995, the Intergovernmental Panel on Climate Change (IPCC) declared for the first time that humans were changing the climate. Its verdict turned on a single piece of then-unpublished research. Four months after the fact, the research was submitted to a prominent journal. Three months later it was published. The world then learned that 25% of the IPCC personnel tasked with making its most crucial determination were involved with this research. 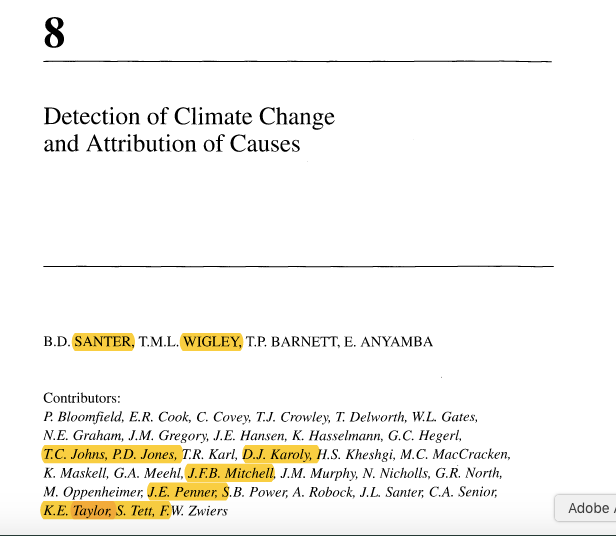 In a naked a conflict-of-interest, these nine people, led by IPCC chapter head Ben Santer, had evaluated the persuasiveness of their own fledgling scientific work – and had judged it sound enough to change history. Academic journals receive thousands of scientific papers each year from researchers hoping to get their work published. Papers that make it to second base are sent to knowledgeable third parties for evaluation. This system, known as peer review, has many shortcomings. But when it works as it’s supposed to, it slams the brakes on exaggerated claims. In Lewin’s words, the title of the published version “heralds no breakthrough finding, but instead only describes a search” for human influence (his emphasis). The accompanying abstract tells us it’s likely that a temperature trend is “partially due to human activities, although many uncertainties remain…” (my emphasis). In other words, the first time outsiders had an opportunity to take a proper look, they weren’t convinced the research demonstrated what the IPCC said it did. Standards at a scholarly journal are evidently higher than at this UN body. A 2010 review of IPCC procedures identified numerous areas of concern. Among them was the startling fact that, 22 years after it had been established, the IPCC still had no conflict-of-interest policy. TOP TAKEAWAY: IPCC scientists routinely pass judgment on their own work – and on the work of their scholarly rivals. But we’re supposed to take its findings seriously. This entry was posted on January 29, 2018 by Donna Laframboise in climate bible, IPCC, quotations and tagged Ben Santer, Bernie Lewin, conflict-of-interest, InterAcademy Council, Intergovernmental Panel on Climate Change, IPCC.